Mark your calendar for events of our pop-up bistro. You never know we may show up at your local street fairs, national food festivals, or one day at your favorite restaurant. Check out our scheduled dates and locations on the calendar and come see us. We look forward to serving you at the next opening of our bistro. To receive our schedule by email, sign up for our newsletter. Click here. Or Tie-up With Your Business. Looking for something unique and tasty to cater your next event? Are you a restaurant or shop owner and wanting to spice up your business? Choose Maze-Maze. We are a pop-up bistro. We mean we can pop-up anywhere from outdoor festival, company convention, fundraising/promotional event, to Yoga boot camp, who knows. We'd also be happy to pop-up at your private party and offer our hand crafted meal package according to your budget. 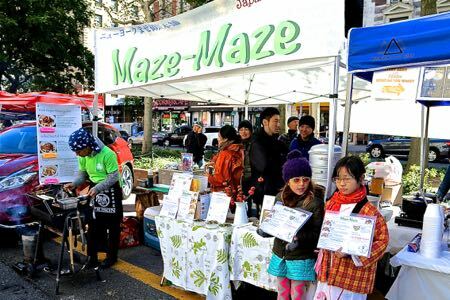 Make your next event or business a successful one with Maze-Maze.